Nuwara Eliya is going to be buzzing again. 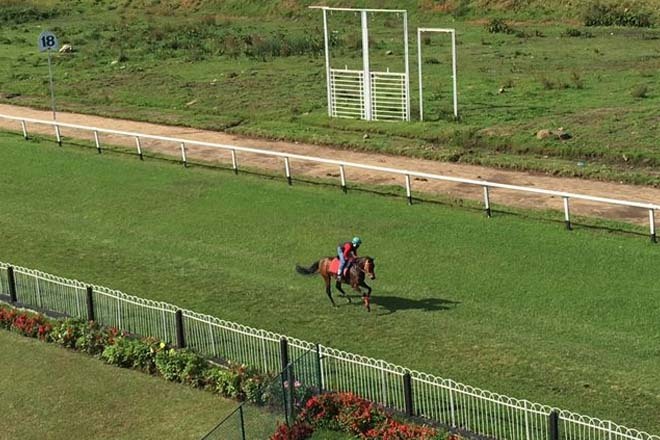 It was almost as if the town had gone into hibernation thanks to the rain in the months of June and July, But suddenly there’s a ripple of excitement in the air and it’s all emanating from the Home of the Royal Turf Club – The Race Course in Nuwara Eliya. That’s the one place that didn’t go to sleep. It was a beehive of activity right through as they prepared to launch the August Festival of Racing. The countdown has begun and blast off is 20th August. Fashion shows by Ramona Oshini, music by Popular Bands, entertainment for kids and all the fun associated with clean racing is on the cards . “Seven races are programmed for the meeting on the 20th August , for which just under Rs 2,000,000 in prize money will be distributed. The feature race will be The RTC Breeze up Auction Class 1 Handicap over 1400M with entries closing at 10am on Monday 15th August 2016”, said CEO, RTC Wayne Wood. As always there will also be prizes galore on offer. The Best Dressed lady will get an item of jewellery courtesy Sifani Jewellers, while the Best dressed Gentleman will get a voucher from Hameedias . The Best Hat will receive a gift pack and vouchers from Spa Ceylon, while Spa Ceylon will also give out gift packs for all VIP invitees . The new set of starting gates, the new saddling and sampling area will also be completed for the races on the 20th and spectators are assured of a weekend of fun up in little England . “Make sure you are there to watch ‘ the hills come alive’, complete with Racing at the Highest Level ”!